Happy Commute designs the happiest journey for urban commuters, and minimises their stress by transforming the daily commute into a playful social experience. As the urban population grows, our infrastructure struggles to keep up to the number of commuters in our cities. Rush hours quickly become one of the most stressful times for urban dwellers, and commuting is having significant negative impact to our overall well-being. Is there something we can do to make commuting less stressful and even enjoyable? 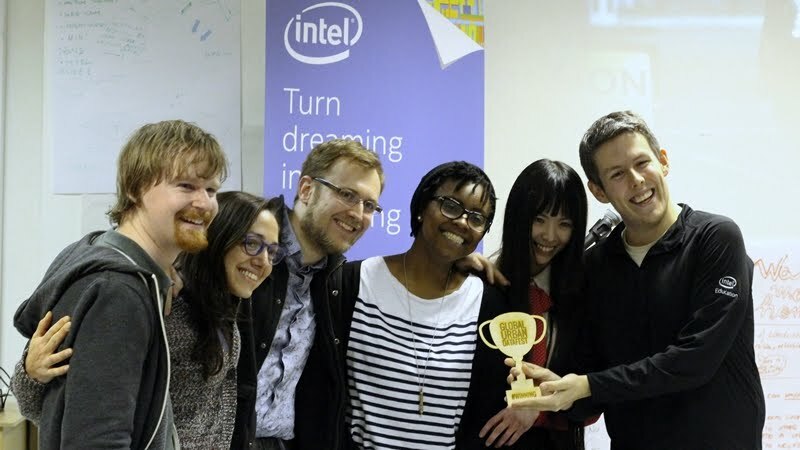 How can we deliver happiness to urban commuters? We first needed to understand what makes people feel happy, and the 10 keys to happier living by Action For Happiness provided a good foundation that we've then incorporated into our project. We cannot help someone become happier if we don’t have a way to understand what makes them happy. 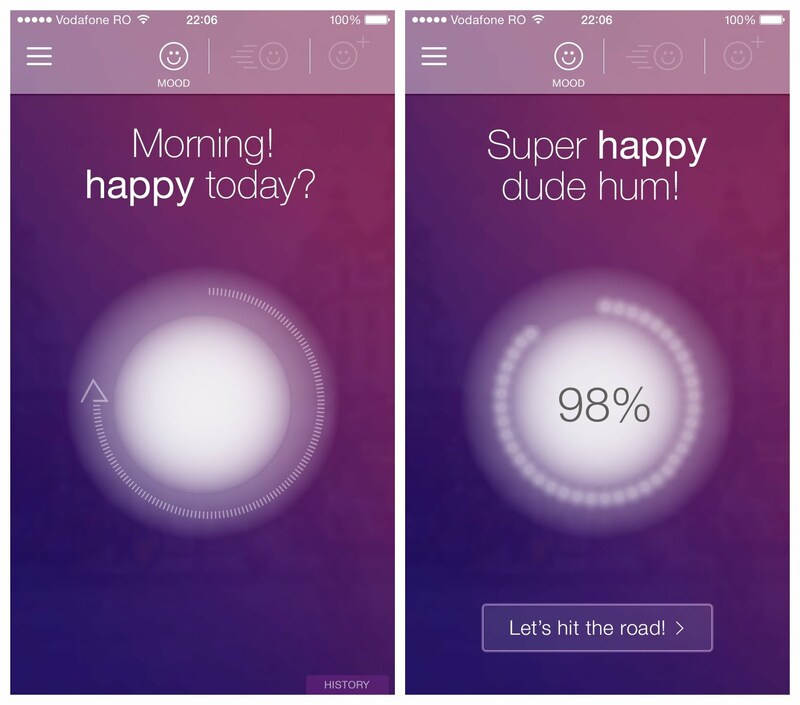 So the Happy Commute app would be like a good friend who always cares about how happy you feel every day and learn what makes you smile. With the power of data including weather, live traffic condition, air pollution level, carbon footprint, your stress level, and more, the Happy Commute app suggests the happiest route rather than the fastest route based on what matters to you the most. 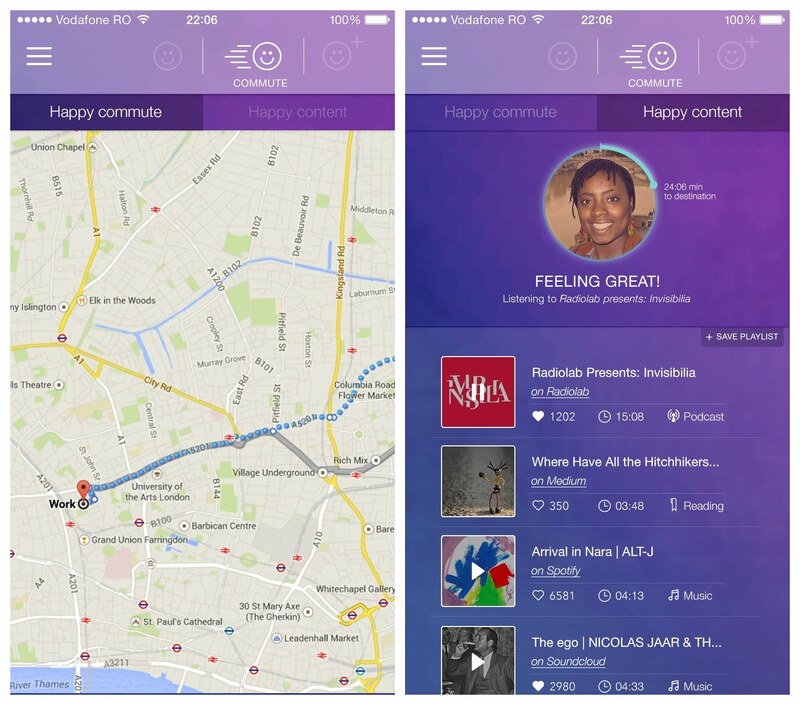 Based on your interests and commute time, the Happy Commute app curates a playlist of music, podcasts and articles to lift your mood and fulfil your curiosity along your journey. Discovering new things make us happy. 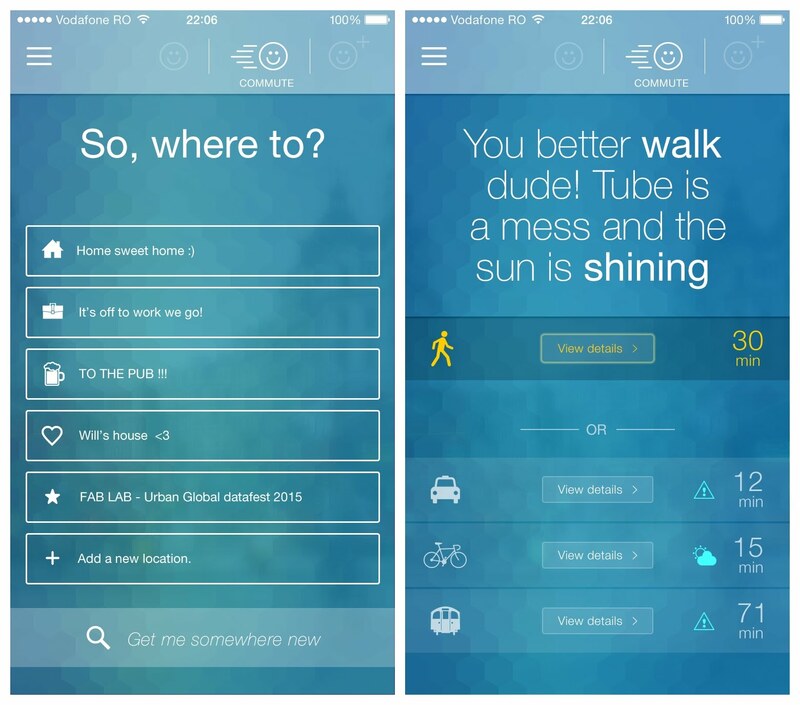 Please take a look at our interactive Happy Commute app prototype here. https://github.com/global-urban-datafest/happycommute For the Happy Commute, all of our code is available on our github page. 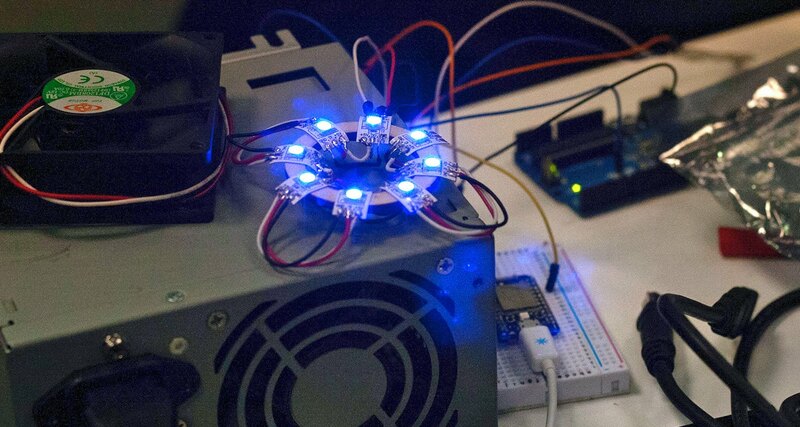 Over the hackathon weekend, we built or LED “brooch” using an Arduino, which controls the Neopixel LEDs using the OneWire protocol. Due to time pressure, we used an Intel Edison as a network gateway and MQTT subscriber for receiving colour change information from our backend. The system worked but wasn’t the most efficient use of resources so after the weekend, we decided to put a bluetooth module on the Arduino and use our app as the gateway device. The current version of the system has a fully functional connection from the Bluemix Node-Red backend, to an MqTT broker, to an Ionic mobile app and on to the LED “brooch” via Bluetooth. So a hex RGB colour can be sent the whole way through the system and is transitioned into on the LEDs. We’ve added smooth colour transitions and a “breathing” style of pulsing the LEDs too to make the transitions and operation more appealing. We have a number of issues on the backlog and will address these in the coming weeks. The backend for our web app was implemented with Node-Red. We had MQTT publishing node that dynamically changed the colour of our LEDs through the Internet. Our hardware subscribed to this topic for downloading the colour settings. We initially ran this on Bluemix but had to migrate the Node-Red instance to AWS because of connectivity issues with the Bluemix servers. The link to our Github is just above here and all the code is freely available there. We are social animals. A sense of belonging and connecting with others is crucial for our happiness. In a crowded train or bus, we are physically and uncomfortably close to other urban commuters, and we rarely feel connected with them. We might even feel hostile when someone accidentally steps on our feet or pushes against our shoulders. It’s unrealistic to ask commuters to simply start chatting with one another, but what if we can create a sense of interconnectedness amongst them? 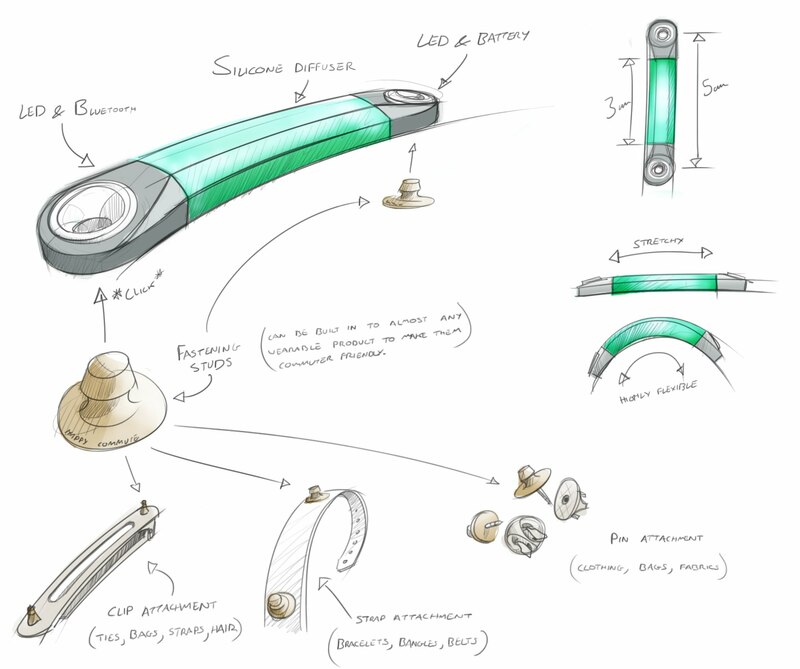 Borrowing nature’s wisdom of emergent behaviours, we've designed a simple and versatile light-emitting wearable accessory that uses colour, frequency and intensity to visualise the type of content you’re consuming and your destination. Like how fireflies synchronise their glows to find their tribes, we want to use this accessory to transform commuting into a social experience. Helping you see the connections you have with the other commuters, dispelling the sense of isolation and perhaps even triggering a conversation or two. FYRFLY is designed to be a small and discrete accessory that can fit in with a wide range of fashion styles and clothing types. Allowing you to have the small light on you wherever you go, whatever you wear. FYRFLY’s ability to work with almost any type of clothing is achieved with two snap-fastener eyelets, one at either end. The use of snap fasteners (similar to what you find on coats) means that FYRFLY can easily be combined with a range of attachments that will allow it to be securely clipped, strapped, pinned or laced onto almost any piece of clothing, shoes and accessories! The snap-fasteners also mean that you can easily detach your FYRFLY when you get to your destination. 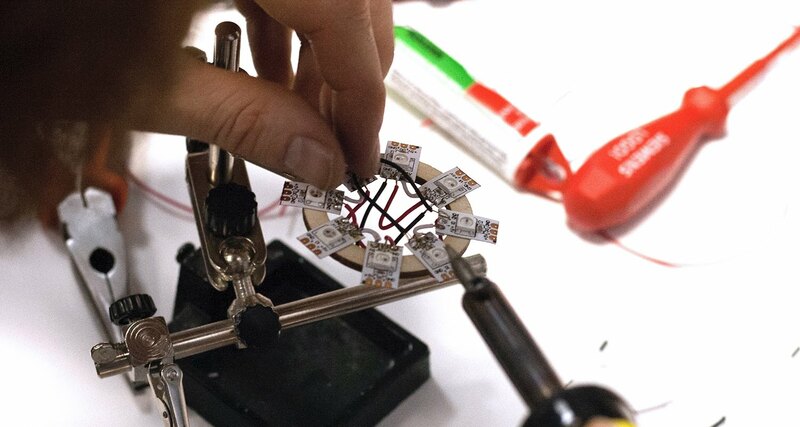 In brief, FYRFLY’s engineering consists of a section of opaque silicone and two metal ends, one end contains the bluetooth device and an RGB LED while the other houses the battery and the second RGB LED. The two ends are connected through the silicone section by a pair of flexible wires to distribute power and signals. Simple enough, so we made a prototype! We believe that the aggregated data from the Happy Commute community has the potential to generate insights that help governments and organisations to develop better infrastructure. The impact of different mode of transportation in various personal and environmental context on mood can yield insight to build smart cities for the public’s well-being. How different types of content and mobile device usage affect one’s emotion can be beneficial for researchers and organisations in technology, media and entertainment sectors to rethink their social responsibilities, and become active participants in shaping happiness. In the short term, we hope to raise funding from organisations and initiatives that support technology start-ups for social good and social enterprises to launch the mobile app. Once the mobile app is live, we hope to invite sponsorship from various content providers who are interested in being a part of the happiness economy. We’ll also plan a crowd-funding campaign for the wearable product - FYRFLY. In the long term, we hope to grow our expertise to generate revenue from consultancy in shaping happiness, expansion of our wearable products and services beyond commuting.